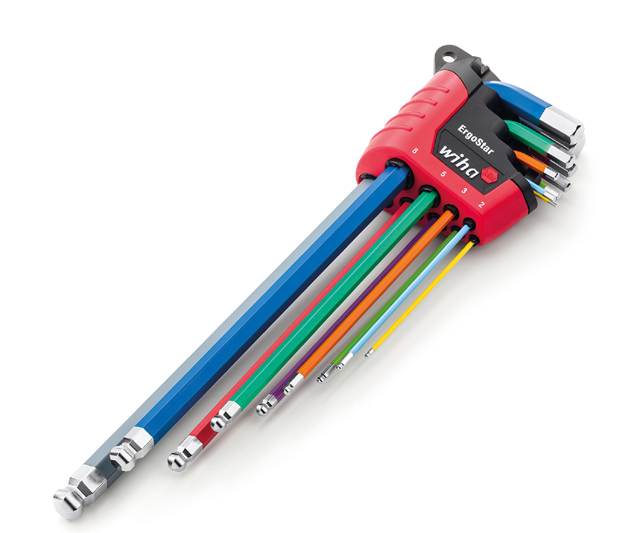 The new Wiha L-keys in a nine-piece set unite several practical benefits in a single element thanks to the colour-coded product design and practical ball end shape. Storage in the ErgoStar holder ensures simple handling and organisation for professionals in their daily work. Users are highly familiar with all too common problems such as dropping, forgetting or losing L-keys while using them on equipment and machines. Wiha now offers the solution with safe storage and a highly visible, colourful appearance. Users can avoid unnecessary delays affecting the entire production process or worse: consequential damage to equipment and machines due to such oversights and mistakes. Thanks to the UV paint, L-keys are quick and easy to find even in the dark or in poor lighting conditions when users shine a suitable light, such as the Wiha torch, on them. The innovative ball end also helps to increase efficiency, making it easier to access screws and allowing users to work at angles down to 25°. The ErgoStar holder is extremely easy to remove or insert L-keys into. Users simply need to twist any L-key in the holder to activate a floating mechanism which turns all keys to the side at the same time and conveniently offers the required key. Suitable clamping makes sure keys cannot fall out regardless of whether the holder is open or closed. Wiha adds true colour to your life and toolbox, not only saving users from hassles but also a great deal of time thanks to its high visibility and findability.